Arrive at least 90 minutes prior to your scheduled departure time. 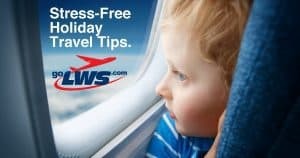 The airport is busier than usual and tends to be filled with less frequent travelers during the holiday season. That means lines at the ticket counter and lines through the TSA checkpoint are longer and move slower. And with Go LWS FREE parking, you’ll want to plan extra time to find a spot. Download your airline’s mobile app to save time before and after you arrive at the airport. You can use it to purchase tickets, check-in for flights, access your mobile boarding pass, get trip alerts and more! Airlines allow one carry-on bag and one personal item, such as a briefcase, laptop or purse. Passengers may bring shopping bags containing gifts with them onto the plane in lieu of a carry-on suitcase, but wait to wrap gifts until you’ve arrived at your final destination and wrapped packages are subject to inspection regardless of whether passengers carry them through security or in checked luggage. Make sure you properly label your checked baggage with your name and current contact information. Learn more from the TSA. Know the 411 on TSAs 3-1-1. People know this phrase, but many are unsure of what it specifically means. Well, according to TSA rules, the “3” stands for 3.4 ounces (100 milliliters) of liquid, the first “1” stands for one clear zip-lock bag holding your 3.4 ounce containers, and the second “1” means per traveler. So there you go, you are allowed one bag with as many 3.4 ounce containers as can fit into your carry-on. There are a few 3-1-1 rule exceptions, so check the TSA liquids rule. Holidays are stressful. Bring a bit more patience with you. Stock up on snacks so you and your traveling companions don’t get “hangry”. Carry an empty water bottle to refill after you clear airport security and bring granola bars, beef jerky, dried nuts and fruit, or other protein-rich snacks to keep you going. Remember, if you’re flying Alaska Airlines and are an Alaska Airlines Mileage Plan™ member, you can check a case of local Lewis-Clark Valley wine FREE when you fly LWS. Check the details.